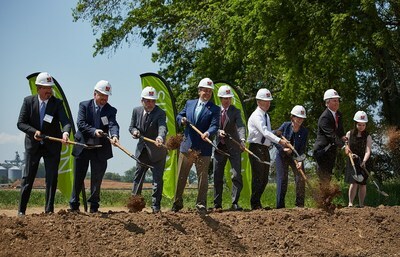 ATLANTA, May 14, 2018 /PRNewswire/ -- Novelis Inc., the world leader in aluminum rolling and recycling, today hosted community members, federal, state and local officials to break ground on its $300 million automotive aluminum sheet manufacturing facility in Guthrie, Kentucky. Representatives from Novelis were joined by Senator Rand Paul, Congressman James Comer, Governor Matt Bevin and Senator Mitch McConnell's staff to recognize the investment of a 400,000 square foot facility that will create approximately 125 jobs and produce annual nameplate capacity of 200,000 metric tons. Novelis will begin producing automotive aluminum at the site in 2020. "The increased adoption of aluminum in cars, trucks and SUVs, coupled with more automotive manufacturing plants in the southeast makes Guthrie a strategic location to serve our customers," said Steve Fisher, President and CEO, Novelis Inc. "With the strong, highly-skilled workforce in Kentucky, we believe our culture and commitment to building a sustainable world together will have a lasting and positive impact on this community." The significant positive impact of tax reform in the U.S. reinforces Novelis' decision to expand at this time. A favorable economic environment has enabled Novelis to recently finalize key contracts totaling approximately $60 million for engineering plans, site preparation and state-of-the-art equipment for the greenfield facility. The facility will include heat treatment and pre-treatment lines, which prepare aluminum for use in vehicle parts such as body-in-white, hoods, doors, lift gates and fenders. Paul Banks, a 25-year veteran of the aluminum rolling industry, will oversee the project as Plant Manager, having previously served as Unit Manager at Logan Aluminum, a Novelis joint venture in nearby Russellville, Kentucky. Novelis brings to Guthrie a proud 34-year history of supporting jobs in Kentucky and investing in local communities. The company employs 1,260 people in the state, accounting for more than $146 million in wages and benefits each year. In addition to Logan Aluminum, Novelis also operates an aluminum beverage can recycling plant in Berea, Kentucky. "Kentucky's workers are some of the best in the world – driven by ingenuity and determination," said Senator Mitch McConnell. "I am proud that Novelis has chosen to reinvest in our people and our Commonwealth by breaking ground on this new facility. It's a prime example of the good news we're hearing from across Kentucky and the country since Congress passed historic tax reform last year. Today's ground breaking exemplifies the remarkable promise ahead." "I was thrilled to join Novelis as they expand operations and create new high skilled jobs in Kentucky. I look forward to continuing my efforts to promote pro-growth tax reform legislation and policies to help manufacturing companies like Novelis thrive and grow," said Senator Rand Paul. "I am fortunate to represent such hard-working men and women from the First District of Kentucky," said Congressman James Comer. "Novelis' investment in this new plant demonstrates the value of Kentucky's community of highly-skilled, advanced manufacturing workers. This is just one of many benefits of tax reform that we are seeing, and I look forward to continuing to work with industry leaders to grow the economy and create jobs. I thank Novelis for this great investment in our Kentucky workforce, and am eager to witness the benefits this facility will have on Guthrie and surrounding counties." "How fortunate for us to be part of this incredible global company. These are the kinds of investments that are transforming Kentucky and transforming the industry," said Kentucky Governor Matt Bevin. "My vision for this state is simple, and that is, that we will be the center for engineering and manufacturing excellence in the United States of America. If we can go all the way down the supply chain, not just to fabricate materials but to roll those materials, to smelt those materials, to slit those materials – whatever the case might be – to get those materials to market; these are the kinds of things that are going to transform the state. And that's exactly what we're doing. Western Kentucky is primed for growth." According to Ducker Worldwide, automakers are expected to increase the adoption of high-strength, lightweight aluminum in new cars and trucks over the next decade. This investment will grow Novelis' leadership position as the first choice for automotive aluminum sheet and deliver consistent quality products to automakers as they turn to aluminum for the benefits they see in vehicle performance, safety as well as the ability to extend electric battery range. The company continues to hire for key roles at the new facility to ensure an efficient and safe production ramp-up. Click here to view available positions. For additional information, visit www.novelis.com/guthrie. Novelis Inc. is the global leader in aluminum rolled products and the world's largest recycler of aluminum. The company operates in 10 countries, has approximately 11,000 employees and had $11.5 billion in revenue for its 2018 fiscal year. Novelis supplies premium aluminum sheet and foil products to transportation, packaging, construction, industrial and consumer electronics markets throughout North America, Europe, Asia and South America. Novelis is a subsidiary of Hindalco Industries Limited, an industry leader in aluminum and copper, and metals flagship company of the Aditya Birla Group, a multinational conglomerate based in Mumbai, India. For more information, visit novelis.com and follow us on Facebook at facebook.com/NovelisInc and Twitter at twitter.com/Novelis.